(Reuters) - Nokia has delayed the launch of a large-screen "phablet" device, originally planned for late September, following a deal to sell its handset business and license patents to Microsoft, a source said on Monday. Nokia had planned to announce new devices including a phablet, a smartphone with a screen larger than 5 inches, to revamp its lineup of Lumia smartphones which use Microsoft's Windows Phone software, according to sources familiar with the plan prior to the Microsoft deal. One of the sources said the launch event, originally scheduled to take place in New York late this month, has been pushed back by several weeks. 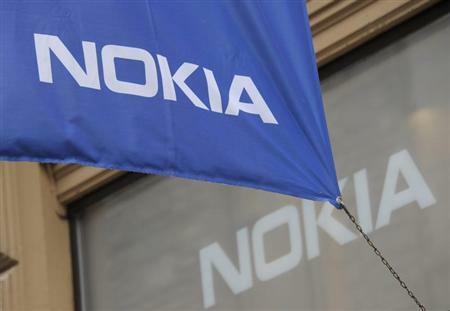 Reuters could not confirm a new date, and a Nokia spokesman declined to comment. Nokia and Microsoft are still operating as separate companies as the 5.44 billion euro deal, which was announced on September 3, has not yet closed. But Chief Executive Stephen Elop, who was hired from Microsoft in 2010 to turn the company around and is returning to his former company after the deal closes, has stepped aside to avoid potential conflicts of interest. Under Elop, Nokia struggled to close the gap with Samsung Electronics and Apple in smartphones, although it has stepped up its pace of product launches in the past year. Market leader Samsung has led the way in phablets, proving wrong early critics who said they were too clunky. Apple has become the top seller of tablet devices.